'Red Spinach' lots of protein, fat, carbohydrate, potassium, iron, amarantin, routine, purine and vitamins (A, B, C). Efficacy of of spinach in general is to improve kidney function and digestion. 'The roots of red spinach' efficacious as a medicine dysentery. Spinach including fibrous vegetables that can be used to streamline the process of defecation. Fibrous food is highly recommended for consumption by patients with colon cancer, diabetic (diabetes mellitus), cholesterol, high blood pressure and decreased weight. Red spinach leaf infusion of 30% per orally can increase the levels of serum iron, hemoglobin and hematocrit 'Rabbit', which made ? ?significant anemia. Parts used are the leaves and roots. Indications: 'leaf spinach' is used to purify the blood after childbirth, strengthens hair roots, low blood pressure, anemia and kidney failure. The roots are used for the treatment of dysentery. How to use ie: for the drugs taken, provide 25-30 g of fresh leaves, then boiled and eaten as a vegetable. Apart from boiled, spinach can also be juiced for a drink. For external use only, minced fresh spinach leaves until soft, then paste on bite wounds caused by venomous animals. 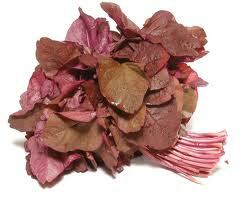 Increasing the kidneys work and to mempersihkan blood after childbirth: 'spinach red'can be consumed as a vegetable. Less Blood: washing three handfuls of 'red spinach leaves', then mash until smooth. Add a tablespoon of 'lemon juice', then strain. Next add a tablespoon of honey and a 'yellow chicken egg' and stir until smooth, then drink it and the treatment was done once a day for a week, then treatment can be done twice a week until the disease is cured. To treat dysentery: wash 10 cigarettes 'red spinach root' to clean then mash until smooth. Add 'salt' tip of a teaspoon, stirring evenly, then strain. For treatment, drinking water filter at a time. Strengthen hair roots: wash one bundle 'leaf spinach' and 'stem spinach' clean fresh until then mash until smooth. Add 'salt' tip of a teaspoon, stirring evenly, then squeeze and strain and drink as well. Do it 2-3 times a week. For patients with blood uric acid levels are high enough and Rheumatic Gout forbidden to consume the spinach too much, because these vegetables contain high purine. In the body, purines will be metabolized into uric acid. In general, in terms of treatment 'red spinach' more nutritious than 'green spinach'.